What a great theme for this week's Gallery! 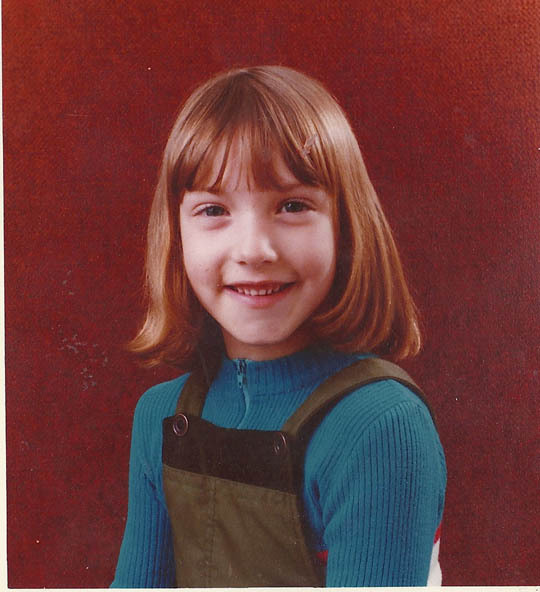 This is me age 7. The same age as my youngest daughter is now. I can clearly remember the day this was taken because someone threw up in the corridor and the caretaker covered it up with a big bucket of sand. Nice. I love the fact that I'm accessorised by a red leaf in my fringe. Why the hell didn't someone tell me? Whatever you do this week, make sure you find some time to view the other Gallery entries. If nothing else it will give you a good laugh! Stop by Biba's post too. I wouldn't have noticed the leaf until you mentioned it! I had a jumper like that. Happy memories. I bet you put that leaf there to have a good story to tell in years to come! BTW you look so sweet! ha! there are a lot of old photos coming out of the closet today, great shot, leaf and all. Haha, I didn't even notice the leaf until you mentioned it. Loving the vom being covered up by sand - how lovely! I had one of those ribbed jumpers - if your taking that photo why on earth wouldn't you remove the leaf? I love the leaf, and the fact that you commmented on it! Look at you look at you! That is a brilliant photo Sian, it screams 'I'm a cheeky wotsit' from every corner of that smile! Great photo and lol at the leaf. I think I'm going to have to post my big girls' first school photo together to give you an example of things in a school photo that someone should have rectified! Ha ha ha ha I love the leaf!!! I can't believe I didn't know you're a reddie too! We're in the cool gang now! Although I wasn't then! Oh I can still remember the smell of that sand even now. Do they still use it in schools? And yep, remember it well - bit of sand, that'll fix the sick! LMAO You are so cute! Yeah why wouldn't the photographer say something about the leaf? To funny! Love the red leaf! And what was with the sand on the puke (or pee for that matter!) Obviously one of the highlights of being a caretaker! Awww you are so cute! He he the leaf made me love, we girls do like to accessorise. I ment laugh lol I must love the look, off to find me a leaf! !